Rome has been called for a very long time "The Eternal City". 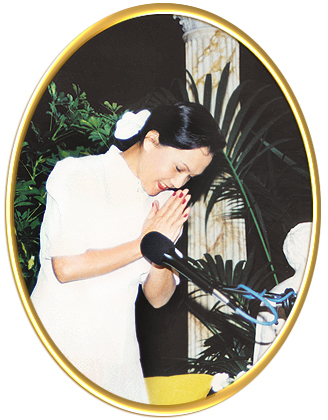 Thus it wasn't just by chance that Supreme Master Ching Hai decided to deliver a lecture, "Immediate Enlightenment: One Life Liberation" there. 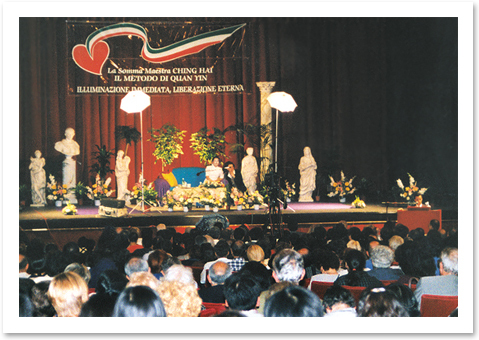 On May 22, people of all nationalities came to the cozy "Teatro Bracaccio" to listen to Master speak. The stage was nicely decorated with antique statues and columns next to Master's seat. Master mentioned that She had almost forgotten how beautiful it was in Italy, with its magnificent architecture, especially in Rome. She used to be able to speak some Italian, but now She can only understand a little. Why did She forget? It is because everything that we don't practice we forget. Master said, "It's the same with the quality of God. When we are introduced to heaven again for the first time, we will also think it is the first time." During the lecture, Master coughed often, due to the fact that many Europeans smoke in public places. While talking about this topic Master said, "So some of us, even though we love God, we want to know God, we don't know how to find God directly, and in the hunger for spiritual knowledge, for divine love, we grasp everything that makes us feel a little satisfied, a little intoxicated, or a little blissful for a while because these are the substitutes that we can get at hand, like alcohol, drugs or cigarettes, which are actually poison and just make us even less close to God." "War and troubles, misunderstanding, anger, and hatred are all the outcome of this frustration of not knowing God. All evils that we think humankind is capable of doing come from this thirst for the knowledge of God. It is ironic, paradoxical, but it is true. It is a desperate call for help. Because they just don't know what else to do, they have to resort to violence, just like when you scream out loud." "So the people who make war are the people who really are the most desperate for love and for help. But because they are so fixed in this desperation, it is also not very easy to bring love, wisdom and understanding into their state of being. Just like when someone is so sick already, he doesn't even recognize doctors, least of all even being graceful to them. So before we fall into this desperate state, we had better take care of ourselves and take care that we can find the love of God so closely, more practically, so that we don't ever need to experience this kind of helpless situation of deepest desperation."